We found a turtle cruising through our backyard today. It looked a lot like the turtle that laid eggs in the front yard, but it didn't go there. We had a big rainbow across the backyard tonight! My lacrosse team played in the White Bear Lake lacrosse tournament again. While we lost the first game, we won the next two to be champions of the consolation bracket. Here are some photo highlights. The best part was that our cousins came up to watch me play and had lunch with us! Every week, I have to change Hammy's bedding and clean his cage. That gives him some time to run around in his hamster ball! 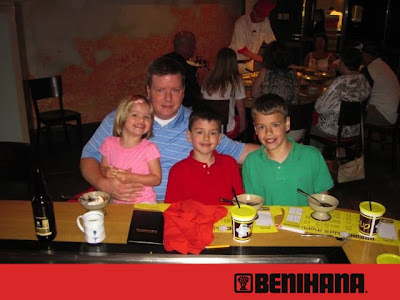 This year for Father's Day, we took Dad to Benihana for dinner. It was a lot of fun watching our chef do silly things with shrimp. They even took this awesome photo of us with Dad. Mom left me at Aunt Michelle's for a few days, so naturally, Aunt Michelle bought me a hamster. I named him Hammy. We played out first field lacrosse game this summer. We beat Minnetonka Team #1 4-0. I was down on the farm with my cousins and I was horsing around when I broke my foot. In case you can't see the break, here it is outlined in yellow. I still had fun with my cousins. I made a birdhouse for Mrs. Thomas, my teacher, as an end of school year present. 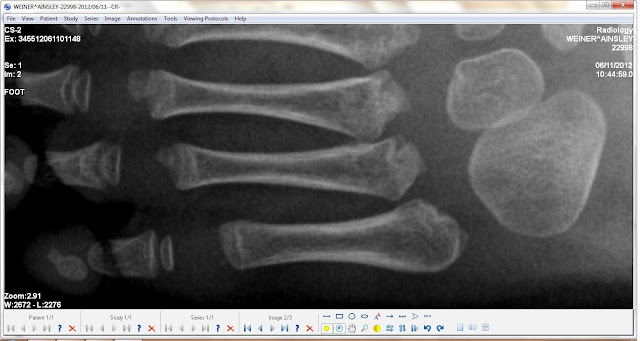 Well, Dad helped me. We were at the park for lacrosse pictures, and we hit the playground before going home. We came home one night and a turtle was laying eggs in our front lawn. We think. Now, we wait and see if anything hatches. Here's a picture of me and Mommy. Every year, my school does a "bike hike" for second graders. We ride our bikes to a nearby park and play games. Here I am with a banana on my back. Here is my whole class. I am hidden behind a young man near the top in the center. You can find me because my friend Andy is giving me rabbit ears.